Slick, snowy roads can fool even the more experienced driver. Slow down! Antilock brakes and all-wheel drive won't help you stop faster. 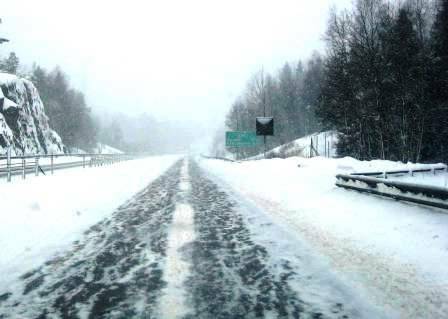 Now that winter is firmly entrenched in our northern latitudes, drivers are trying to cope with the ice, snow, and other hazards that turn roads treacherous and contribute to the more than 1.5 million annual weather-related car crashes, according to the National Research Council. Teen drivers, many of whom facing wintry conditions behind the wheel for the first time, need guidance to safely navigate the roadways through the upcoming months. To help, Liberty Mutual Insurance has a host of winter safety resources for teens click here. And if TDB’s experience is representative, more than teens need to think about navigating a two-ton car through the slop. “Driving in wintry conditions is no easy task, even for seasoned drivers, and it is especially difficult for younger drivers with limited experience to adapt to slippery roads and poor visibility,” said Dave Melton, a driving safety expert with the Liberty Mutual Research Institute for Safety. Before getting behind the wheel, a driving safety video at the site will help teens and parents get winter road-ready and ensure their cars are safe and in good working order. Before you get on the road in bad weather, check your local news stations and their websites for detailed, up-to-the-minute weather and traffic information. If your trip is absolutely necessary, give yourself extra time. During inclement weather put extra distance – at least five or six seconds -between yourself and the vehicle in front. Antilock brakes, all-wheel and four-wheel drive won’t help you stop faster. Turn on your headlights so other drivers can see you. In snow, fog and rain, don’t use high beams – they increase glare for both you and other drivers. Signal your intentions early; don’t surprise other drivers. Do not use cruise control when roads are hazardous. Did we mention slow down! This looks to be good driving safety advice for any season, but even more so during the winter: car crashes are 36% more likely to happen in January than July, according to the National Highway Traffic Safety Administration. and, an exclusive 50 percent discount for teens to take the National Safety Council’s online Defensive Driving Course. This entry was posted on Tuesday, December 29th, 2009 at and is filed under Automobiles. You can follow any responses to this entry through the RSS 2.0 feed. Both comments and pings are currently closed. Having taught 4 teenagers to drive in the snow, I have found one of the best things I can do to ensure their safety is to have good winter tires on the vehicles they drive. Thanks. Nice addition and worth looking at.